As you explore our website, you will find biographies, poems, critical analyses, and bibliographies on various Atlantic Canadian poets. You will also come to realize how talented each of these authors are and how much they deserve recognition. 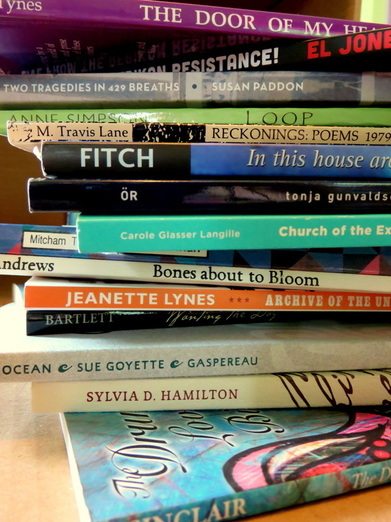 Since its launch in March 2012, the Atlantic Canadian Poets' Archive (ACPA) has grown to include entries on many poets from the Atlantic provinces. Among of them are the contemporary, the foundational, and the obscure. Diversity in style, form, theme, and subject speak to the importance of each entry, which all contribute to our understanding of the poetics of Atlantic Canada as a whole. Many of the poets featured on this archive have received major regional and national awards: Don Domanski, Lesley Choyce, Sue Goyette, John Steffler, Tonja Gunvaldsen-Klaassen, and Susan Paddon have all won the J.M. Abrahams award (formerly the Atlantic Poetry Prize); Don McKay is the two-time winner of the Governor General’s Poetry Award, along with previous winners Al Purdy, George Elliott Clarke, and nominees Tammy Armstrong and Lynn Davies; both McKay and Anne Simpson have won the Griffin Poetry prize. The Archive also includes entries on unsung, yet deserving poets. The editors of the ACPA have made it their goal to celebrate each poet individually and the genre of Atlantic Canadian poetry. Although the ACPA has many entries, it does not represent the entirety of Atlantic Canadian poets. The poets featured on this archive are selected by undergraduate scholars, whether out of personal interest or because a poet's work was studied in class. As such, we have composed an extensive compendium of Atlantic Canadian poets yet to be written on as a resource for future students and ACPA submissions. Please consult our Resources page for this list and other helpful tools. This Archive represents a big step toward raising awareness of the talented writers in this great backyard. While our work is based out of St. Thomas University in Fredericton, NB, we accept submissions from all across Atlantic Canada. We seek to provide a venue for scholarly voices and we wish to extend this conversation. Have a submission? Question? Concern? If you are looking to submit to the archive, please indicate which Atlantic Canadian Poet you are submitting an entry for. The Editors will get back to you with further details as soon as possible. The creation of the Atlantic Canadian Poets Archive would not have been possible without financial contribution from the Canada Summer Jobs Grant. This anthology was created and maintained by St. Thomas University’s English Department, with Evan Mersereau serving as Managing Editor for 2018-19. The project is overseen by English professor, Dr. Kathleen McConnell. Thank you to our previous editors Lisa Banks, Nick Geldart, Monica Grasse, Allyson Groves, Patrick O’Reilly, Kathleen Pond, and Mallory Ross for their dedicated work in editing and publishing entries, creating their own submissions, and maintaining a flawless website. The ACPA would not be what it is without you. We are thankful to those who submitted their scholarly work to be included in this anthology. Additional thanks to Dr. Elizabeth McKim, the 2010-11 “Atlantic Canadian Women Poets” Honours Seminar class (Allyson Groves, Lisa Banks, Meghan Loch, Laura Noble, Michelle MacNeil, Ben Savoie, Lexi Whitman, Victoria Embree, and Katelyn Price), the 2011, 2015, and 2018 "Advanced Poetry Workshop" classes, and Dr. Kathleen McConnell’s 2014-15 “Contemporary Atlantic Canadian Poetry” Honours Seminar class (Ben Lord, Sharisse LeBrun, Molly Strickland, and Monica Grasse) at St. Thomas University for their contributions to the production of this archive. Thank you to the poets who allowed their work to be included in this anthology – without you, we would not have been introduced to your talented work, and would not have found our passion for sharing your deserving work. Many thanks to Jeffrey Carleton (Director of Communications, St. Thomas University) for his help and support with this endeavor. Thank you to Jacqueline Cormier (Communications Officer, St. Thomas University) for our stunning cover photos.